1= RCA male plug on cable. 2= TS (Tip-Sleeve) or 1/4” (6mm) mono male plug on cable. 3= Older “Amphenol” microphone jack. Plated brass ring screws onto chassis mount threaded male assembly. Used on many vintage microphones. 4= TRS (Tip-Ring-Sleeve) or 1/4” (6mm) stereo male plug on cable. 5= XLR-3 female cable connector. 6= XLR=3 male cable connector. 7= Adapter: TS (Tip-Sleeve) or 1/4” (6mm) mono male plug to RCA female jack. 8= Adapter: mini TRS (Tip-Ring-Sleeve) or 1/8” (3.5mm) male plug to TRS (Tip-Ring-Sleeve) 1/4” (6mm) stereo female jack. 9= Mini TS (Tip-Sleeve) or 1/8” (3.5mm) mono male plug. 10= TRS (Tip-Ring-Sleeve) or 1/4’ (6mm) stereo male plug. 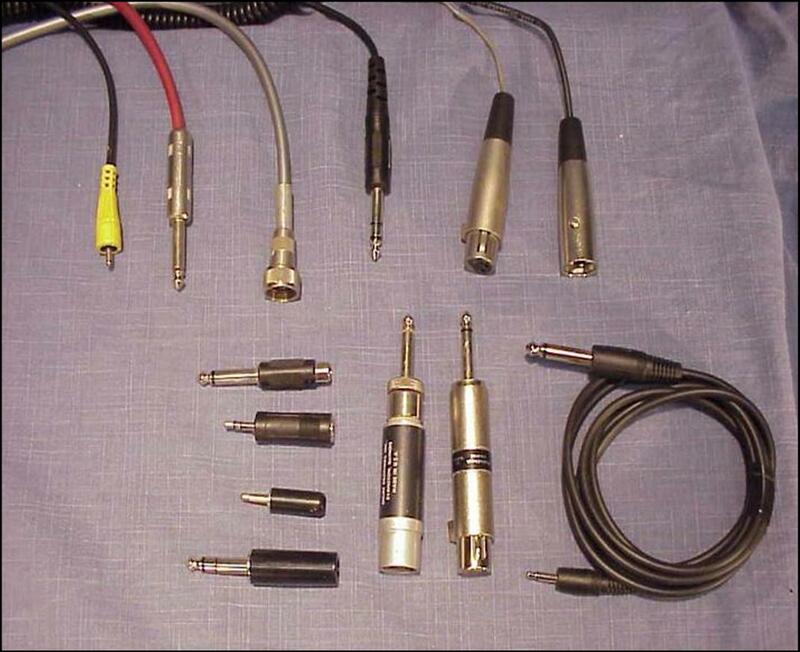 11= Convertor/Adapter for microphones. XLR-3 male plug to TS (Tip-Sleeve) or 1/4” (6mm) mono plug. It contains an internal set-up transformer for balanced mic/pickup to high-impedance, unbalanced output. 12= Convertor/Adapter for microphones. XLR-3 female connector to TS (Tip-Sleeve) or 1/4” (6mm) mono male plug. It contains an internal set-up transformer for balanced mic, low impedance, to unbalanced, high-impedance output. It is used for adapting a Pro balanced, low-impedance mic to an amplifier. 13=Adapter cable with a TS (Tip-Sleeve) or 1/4” (6mm) mono male plug on one end to a mini, TS (Tip-Sleeve), 1/8” (3.5mm) mono male plug on the other end. This cable can be used to connect the HC Four Line-Out to a computer sound card input-Line-In connector only.